Student-directed learning allows for students to direct the learning experience through a series of choices. Included in this product are problem-based learning, project-based learning, service learning, and scientific open inquiry activities. 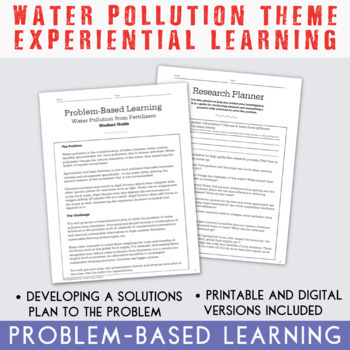 This resource covers an entire water pollution unit using a combination of these student-directed learning activities - how pollutants enter the water table, the chemistry of pollutants and how they change the chemistry of the water, the sources of water pollution, the impact water pollution can have on aquatic ecosystems, water pollution in the context of real-world impacts, and solutions to the problem of water pollution from human activities. All of the content knowledge gained in this unit falls under the "Earth and Human Activity" NGSS. What's more is that the skills utilized and developed in these activities are in the NGSS as well, such as problem-solving solutions (PrBL), using technology to demonstrate learning (PBL), and gathering evidence to support an explanation (scientific inquiry), among others. Most importantly, student-directed activities like the ones included here help develop lifelong learning skills. 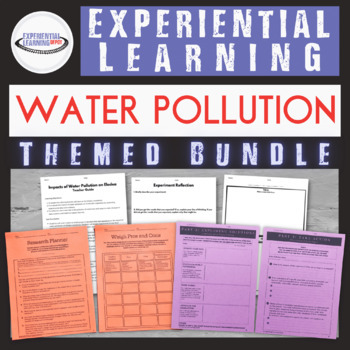 Worksheets and extension activities are included in this resource that go along with two Vice News episodes related to water pollution. Vice News shows the issue of water pollution in real-world contexts. Both episodes included here are available on Youtube by Vice - Meathooked and India's Water Crisis. 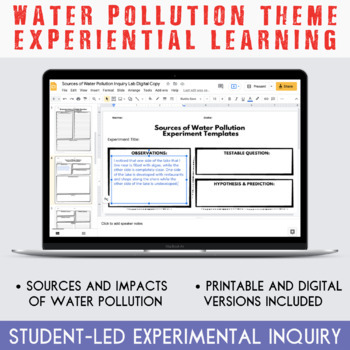 This student-directed project-based learning resource is meant as a wrap-up to this unit on water pollution. Students will take all of their skills and knowledge gained from the previous activity to plan their community action projects. 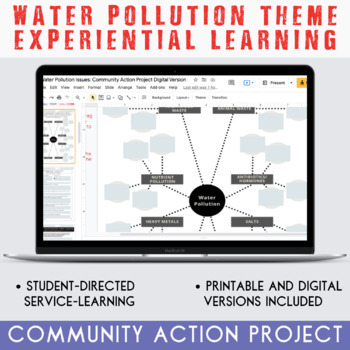 Students will study one specific topic under the theme of water pollution of their choosing (such as ocean plastics, bioaccumulation and human consumption of fish, and acidification, among others.) They will then plan a course of action to make change and act on it. For example, they decide to focus on ocean plastics. They plan to start a pledge program for citizens to refuse single-use straws. Students create a website and related social media pages for those that pledge as a place to document their progress and experience and hold each other accountable. Students also decide to meet with local legislators to pass an ordinance that requires local restaurants to use straws that are recyclable or compostable. Students use project-based learning principles throughout the course of this project. Thank you for using this product! Experiential Learning Depot owns the copyright to this resource and you are being licensed as a single user of this product. You may use this product for multiple classrooms and reference the product in blogs, seminars and/or workshops. You may not remove Experiential Learning Depot from the resource, give the product away for free, sell the files, make copies for unlicensed users, or gain access to the resource through means of any of the previously listed methods. Thank you again for using this product! Please reach out if you have questions or comments about this resource. Come visit us again soon!